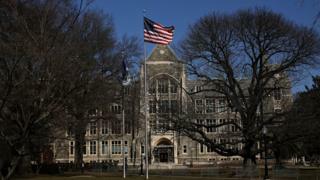 Georgetown University students in Washington DC have voted in favour of a reparations fund to repay descendants of slaves sold by the school in 1838. A "Reconciliation Contribution" fee of $27.20 (£21) each semester would benefit descendants of the 272 slaves. Undergraduate students passed the referendum with a 66% majority, but the measure requires approval by the university. Georgetown is the first major college to pass such a reparations fund. The student-led referendum was organised by the group Students for the GU272. The university's elections commission reported that nearly 60% of students turned out to vote on Thursday. The fee amount was chosen to remember the 272 enslaved people sold, but also so that it would not be too large of an increase in tuition, a student involved with the group told the New York Times. If approved by the university board, the fund will go towards "charitable purposes" benefitting the descendants of those slaves, many of whom now live in Louisiana and Maryland. Critics of the fund say it is an arbitrary amount that will not address any real issues, or that it should be the burden of the institution, not the students, to repay descendants of slaves. Some students have said it is an unjust moral imposition on students to make the fee mandatory. Should black Americans get slavery reparations? Should the term 'racist' be redefined? Todd Olson, vice-president for student affairs at the university, said in a statement: "We value the engagement of our students and appreciate that they are making their voices heard and contributing to an important national conversation." In 1838 the Jesuit university decided to sell the slaves to plantations in Louisiana to pay off debts, in a deal worth the equivalent of $3.3m. Georgetown has been making amends for its past connection to slavery since 2015, Mr Olson noted. In 2017, the institution formally apologised for selling the 272 slaves, and renamed a campus building after Isaac Hawkins - the first enslaved man listed in the 1838 sale. The historic vote among Georgetown's student body comes as 2020 Democratic presidential hopefuls have also brought talk of slavery reparations back into the mainstream. Senator Cory Booker of New Jersey on Tuesday filed a bill to create a commission for studying reparation proposals. Senators Elizabeth Warren of Massachusetts and Kamala Harris of California have also expressed support of some kind of reparations.